← Accusing Elizabeth Giveaway Winners! 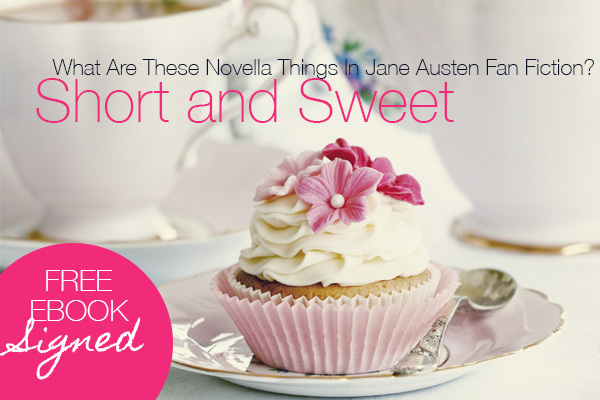 Short and Sweet Reads: What Are These Novella Things In Jane Austen Fan Fiction? When I started reading JAFF I chose my books taking into consideration several aspects, and length was definitely one of them. Yes, I was prejudiced towards Novellas! I am ashamed to say it, but there it is. One day, after reading Compromised by Joy Dawn King, I saw that the first chapter of The Trouble with Horses by Elizabeth Ann West was available as a bonus, and even though it was late at night, I decided to give it a try. That was the day my eyes were opened towards novellas! I liked the first chapter so much that I immediately bought the novella, read it without stopping and loved it! And so it was that I left my prejudice behind, accepted that novellas can be just as good as longer stories. As it was an Elizabeth Ann West novella that opened my eyes, I thought it only befitting to invite her to From Pemberley to Milton to talk a little about this genre. And this is where novellas, a story form as old as novels, are seeing a major resurgence in digital publishing. People are busy. They are squeezing their reading in between lunch breaks, on commuter routes, even while waiting in the school pickup lane! And with a Kindle or Nook or Kobo or iBooks, your entire reading library is with you at all times on your smartphone or tablet. So is a novella just shorter than a novel? Technically, yes, the distinction of novel versus novella for many literary awards hinges on word count. But deeper than that, at the story level, a novella is usually either more focused on the main character’s plight or in my case, a serialized, episodic saga. In reading time, a novella usually takes an avid reader about an hour to two hours to read. Just like a TV show! Novellas can be fun to read because there is something satisfying about that desire for more. If you really think about it, every GREAT story leaves you wanting more. More episodes! More books! More movies! More, more, more! Or even in the case where the author has given an epilogue, please give us a title to explore just that future! Am I right? There are some who are prejudiced against novellas, that something shorter than a novel cannot possibly be “good.” But believe it or not, there are MANY cherished classic titles that are, you guessed it, novellas! Have you read Capote’s Breakfast at Tiffany’s? What about Camus’ The Stranger? I know, A Christmas Carol, by Dickens, many had to read that book in school. From science fiction (The Time Machine, Dr. Jekyll and Mr. Hyde) to political satire (Animal Farm), there are award-winning novellas in every genre. It is as authentic of a story-telling art form as a poem, novel, or short story. I write mostly novellas, and for awhile I struggled with how different that would be for JAFF. But when I really take an inventory of the stories that affected me most, outside of Pride & Prejudice, which admittedly I was a late comer to appreciating that story, it is short stories and novellas that have most imprinted on my mind. Ray Bradbury’s All Summer in a Day and Ayn Rand’s Anthem plus a few unnamed short-stories in anthologies, all of these stories are as fresh as memories in my brain. I feel those stories when I think about them. Perhaps that is just the power of those authors, but a big part of it is the laser focus those stories offer on the main characters and their struggles. Throw in a love for twists in stories like The Twilight Zone or Jeffrey Archer’s A Twist in the Tale and Twelve Red Herrings and you end with an author like me: a lover of writing novellas with high drama and a twist on the ending. I would like to invite all of the wonderful readers here at From Pemberley to Milton to try a digital novella on me. I am offering any of my novellas in my Seasons of Serendipity series which is an ongoing saga reimagining what if Mr. Bennet died at the beginning of Pride and Prejudice. If series are not your preference, I also have The Trouble With Horses which imagines Darcy fell off his horse and Elizabeth saved him, and Very Merry Mischief, which wonders what might have needed to happen to get our dear couple together if Darcy never returned to Hertfordshire after Lady Catherine’s upbraiding of our favorite heroine. Not only that, but I will personally sign your file with my own technological magic! Simply leave a comment on this post with your opinion on novellas, or any question you might have and fill out the Google Form here (http://goo.gl/forms/dQa7wOJ67p) and I will work through the list to send the novellas out to everyone who requests one. Yes. Everyone. This giveaway will contemplate all entries until the 6th of February inclusive. 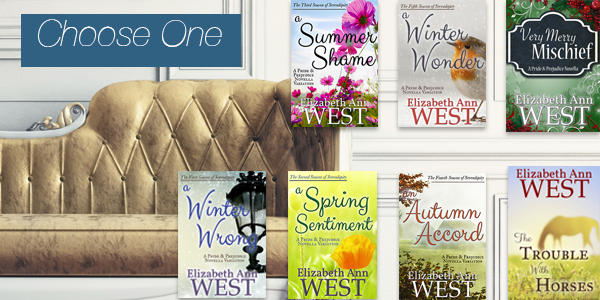 Elizabeth Ann West is a Jane-of-all-trades, mistress to none! 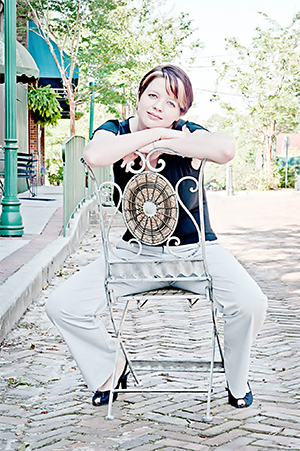 Author of 7 novellas and 3 novels, her books have won reader awards and been purchased in over 20 different countries. Armed with a Bachelor of Arts in Political Science from a small liberal arts university in Virginia, she has worked for Walt Disney World, Alcoa, volunteered as an ombudsman for the U.S. Navy and moves wherever her husband’s military career sends them! Currently living in upstate New York, she is a mother of two, loves to fence, and has a soft spot for Japanese RPG video games. I would like to thank Elizabeth for this wonderful guest post, which I personally find very interesting, her generosity in the giveaway, and her kindness in making every single copy a special and personalised one. Thank you for coming to From Pemberley to Milton Elizabeth! I love and embrace novellas. I still read novels, but novellas are a wonderful fix. This article/interview has given my pause…I usually don’t pay too much attention to novellas. I look at the length and then the price and think that my book budget would be better served by a longer novel. Having said that, I do realize the author deserves to be paid for the story! I would love to try a stand alone…Very Merry Mischief would be delightful. Thank you everyone for visiting today! My day sorta derailed, but I was able to pop in now! I know novellas aren’t for everyone. 🙂 Next time I visit, I promise it will be something fun with my novels. I will start working through the list this weekend and getting the signed files out to everyone! 🙂 Please make sure you fill out the google form so I know what book, file type, and where to send it! I definitely prefer novels, but novellas are useful when I have a short time and want a complete read. I am not a fan of the trend to sell 18, 25, or 40 page short stories/snippets as a novella for novella prices. To be honest, I find this new trend very off-putting for me personally. I have already purchased all of your novellas except for A Very Merry Mischief, so may I please have that one? Thank you! I prefer novels, but novellas can be great when I don’t have much time and I want to finish my quick read in one sitting. Novellas are shorter than novels, so I find that I am more critical of novellas that are not well written since they have fewer words and less chances for explanations, so I expect tighter writing. I am not a particular fan of the recent trend of selling short stories or snippets (with page lengths of 15; 18; 25; 40; etc.) at a novella price. I find it off-putting for me as a reader and it makes me more wary of shorter stories as a whole. That being said, I have no problem purchasing a novella or a book (even a short one) of short stories that is marketed as such. I have already purchased all but “A Very Merry Mischief ,” so I will request that one. Thank you very much! Whoops. Sorry for what is mostly a duplicate. I did the first one on my phone and I thought it didn’t send. I always love reading that–makes me smile every time! Thanks again. I have to admit to having once some prejudice against novellas as well, it took me a long time before buying anything shorter than 200 pages. But as I began to read them, I realized that they were more focused, more to the point. I mean, long novels sometimes takes tooooo long to solve the issues, or they have to come up with some crazy stuff to prevent the final happy ending until the very last chapter, and that began to tire me. So now I read novellas and I like them so much that I’ve decided to try to write my own. Who knows…. I don’t really understand the prejudice against novellas. I’ve always read them and Elizabeth made a a very good list of great novellas of all kinds. I can’t wait to read Very merry mischief! I like whatever Elizabeth Ann West writes – long or short – PERIOD. This was a terrific post and I thank you both for sharing this excellent information. Keep typing, EAW!!! Enjoyed your post, Elizabeth. I like novellas because I have a tendency to not stop reading until I’ve finished. That means more late night reading when I should be sleeping. I think it’s great that your novellas are doing well. In a way, they are harder to write because we don’t have the novel length to do everything: plot, character development, etc. Our writing has to be very tight and still cover all the bases. I’ve enjoyed your novellas, and I look forward to your future ones. Keep up the good work! I chose The Trouble with Horse oh and I want to read the Jane Austin novella’s now to! Thank you for introducing me to the world of novellas.I ashamed to say I’ve never heard of them I love to read the thicker book the better. I am in college now going back at the age of 51 and as you said I”m not finding the time unless it’s late night in bed or in hiding so this is going to be an awesome perfect new experience for me! Thank you for the book ! Your awesome! Following Stay humble.